Registration: Event is free of charge but are only for registered participants. The registration closes on 31.01.2018. CLOSED! 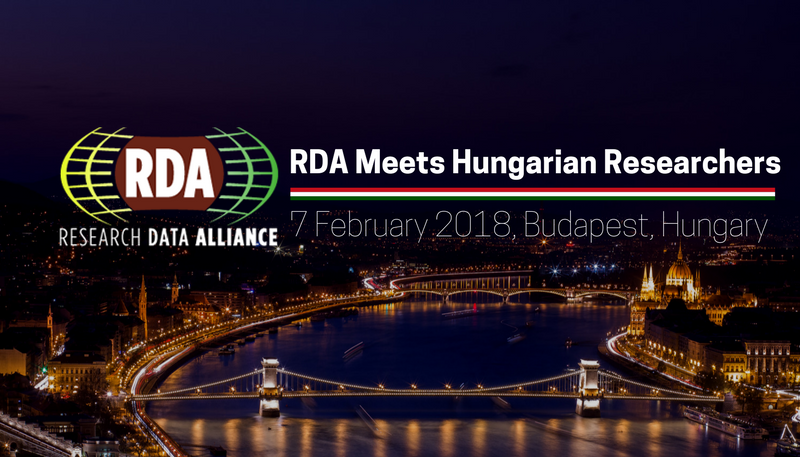 RDA is an international member-based organization focused on the development of infrastructure and community activities that reduce barriers to data sharing and exchange and the acceleration of data-driven innovation worldwide. With more than 6 350 members globally representing 132 countries, RDA includes researchers, scientists and data science professionals working in multiple disciplines, domains and thematic fields and from different types of organisations across the globe. RDA Outputs are the technical and social infrastructure solutions developed by RDA Working Groups or Interest Groups that enable data sharing, exchange, and interoperability. These outputs have an important impact on addressing research data challenges and come with a clear set of guidelines on implementation and/or adoption in infrastructure environments by individuals, projects and organisations. The Hungarian research communities, researchers in general, policy makers in open access to data, open science enablers and the re-use of research data champions are invited to join the meeting and discuss technological as well as sociological challenges around the re-use of research data at the national, European and global level. The event is free of charge, a registration is requested in advance -- Registration is closed!